The Century Series mechanical hanging scale are world-renowned for their accuracy, dependability and reliability and in 2015 they won the Readers' Choice Award for being "Best Retail Scales 2015". The Century Series feature a glass-covered 7-inch dial that reads clockwise. A double dial option is available(one dial reads clockwise, the other counter clockwise). This allows for both the merchant, and the customer to view at the same time the weight of the merchandise or product. These scales feature a corrosion-resistant band, bezel and housing and have a rugged, steel inner frame. Scale capacities are reached in two pointer revolutions. The Centry Series are Class lll "Legal for Trade" scales, and can be supplied with a CG Series scoop or the popular CAS circular pan. The CAS Pan is constructed of stainless steel. 3-inch deep round pan has drain holes. 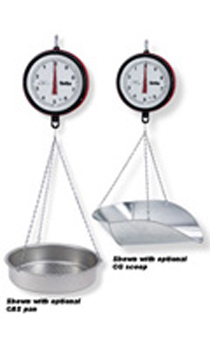 The CG Scoop is ideal for weighing loose materials and foodstuffs. Scoop and suspension chain of galvanized construction. Scale heads, without attachments, are supplied with a 1-1/2 lb start.